The Smile Committee made a big effort to de-stress the 6th years by inviting them for tea and cakes before their Mock exams which begin on 4 February. Much appreciated, folks! The students arrived to school with their orange tops and painted faces to show their awareness of and their belief in the powerful and yet simple message of the day. Cakes, made by TY students and the Student Council, were given out to students at break-time to put a smile on people’s faces. The Gym, decorated elaborately by students, provided the space for the SMILE Choir’s performance later in the day. Catherine Grogan, along with this choir, performed her song entitled ‘Empower Your Voice’. Our very own DJ Biggane entertained us all for a further 30 minutes before the students left to go for a walk in St Anne’s Park. All arrived back to school, tired but happy! We look forward to embracing next year’s theme and we are delighted that this day is now part of our annual calendar. Thanks to Ms Doherty for this report. 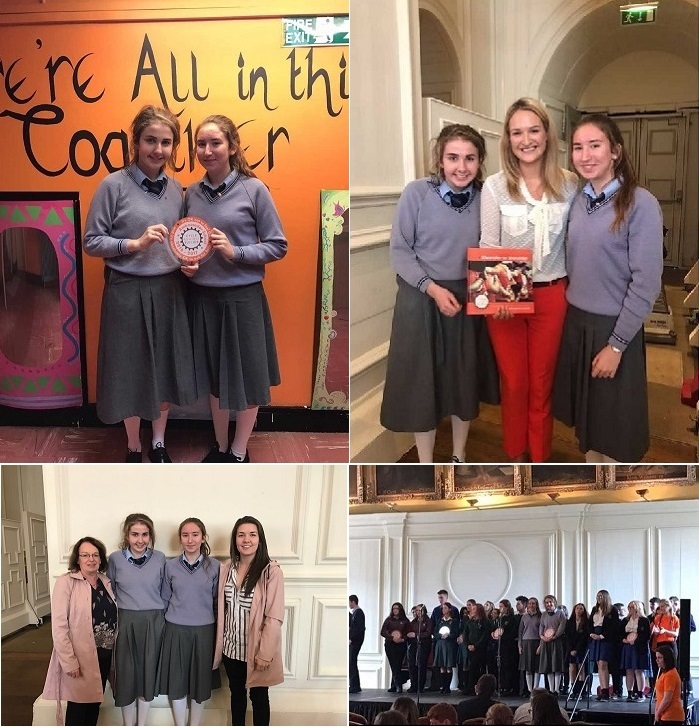 Smile Committee: "Empower Your Voice"
Catherine Grogan, a Transition Year student, composed a song for the SMILE committee, embracing the 2018 Cycle Against Suicide theme 'Empower Your Voice'. Manor House students are going to learn the song as part of the preparations for 'Schools Go Orange Day' on 9 February. Well done, Catherine! Here are the LYRICS. Here is the AUDIO. Off you go, everybody! Get singing! Enjoy the video (courtesy of Ms Fagan). 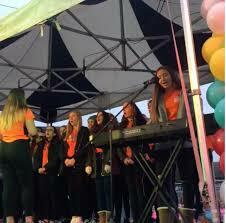 The Smile Choir performed at the Christmas Tree Lighting in Raheny Village on 19 November. They sang "Empower Your Voice" which was written by Catherine Grogan, TY. The SMILE committee organised a Darkness into Light walk on 14 November spreading a message of hope and the message that it is OK not to feel OK and it is absolutely OK to ask for help. We gathered in the school (students, staff members, parents and dogs!) very early and left on our walk at 7am just before the sun began to rise. We walked to the beach where we had tea, coffee and cake and listened to music performed by three of our very talented 5th year students, Ciara, Orlaith and Saoirse. We are all proud and happy to be members of such a warm and caring school community. Well done to Mrs Robinson and the SMILE committee! Two Manor House students accompanied by Mrs Robinson and Ms Fagan attended The Cycle Against Ambassador School Award 2017. Catherine Grogan, TY, and Aisling Bell, 5th year, represented the Smile Committee to collect this award. The ceremony was held in the Royal Hospital Kilmainham. The Manor House delegation was delighted to meet the Minister of State for European Affairs, Helen McEntee, pictured below. This is Manor House's fourth time to receive the Ambassador Award which has been presented to commend the work of our Smile Committee. We hope that this will inspire future generations of Manor House students and staff to continue to spread the vital message that 'its ok not to feel OK, and it is absolutely OK to ask for help' and to continue to help break down the stigma surrounding mental health in our community. Positivity in every corner of Manor House this week - at the positivity picnic, at the Ethiopian Art sales table, in Bull Island - and even on the stairs! 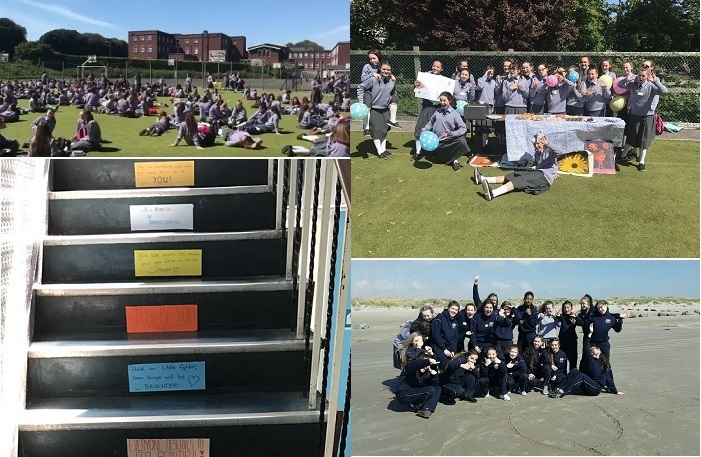 The Smile Committee along with the Home Economics and PE Departments are hosting events throughout the week to promote good physical and mental health. Please click on the image below to see some very useful advice for staying healthy. Manor House school community participated in #SchoolsGo Orange in association with Cycle against Suicide on Friday 17 February. The message was to remember the importance of minding your mental health and the mental health of others. "Its OK not to feel OK and it is absolutely OK to ask for help". The Smile Committee, led by Mrs Robinson, should take a bow for creating this buzz in the school. Thanks to the PE department for letting us invade the Gym and well done to our resident DJ, Mr Biggane for his groovy sounds. Enjoy the images we captured on the day! 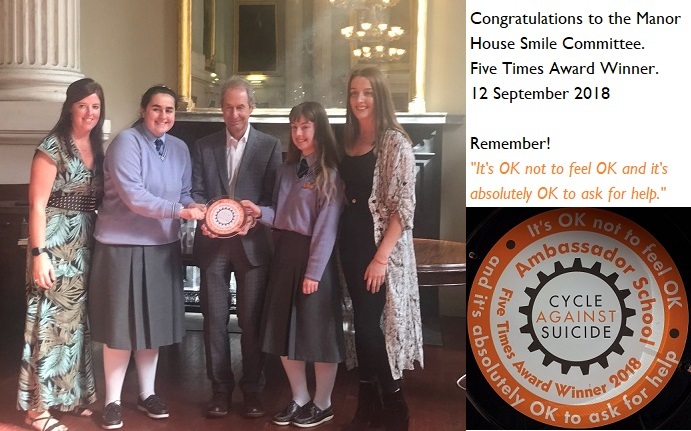 The Manor House Smile Committee, accompanied by Mrs Robinson and Ms Dunwoody, received its Amber Flag in Cork on 17 May. This initiative by Pieta House recognises and acknowledges the promotion of good mental health in our school. Take a bow, folks! The Smile committee is a group of students who promote positive mental health in our school community. Founded in 2013, we now have over thirty members. The group received ambassador status from the charity “Cycle Against Suicide” in 2013. Since 2013 we have had one of fourteen students in Ireland who are selected to become student ambassadors of “Cycle Against Suicide”. The Smile Committee runs a lunchtime disco at least one a month in the PE Hall. We are continuously working on projects to promote positive mental health. Ms Cassidy is certainly doing her best to help others to cope with illness. 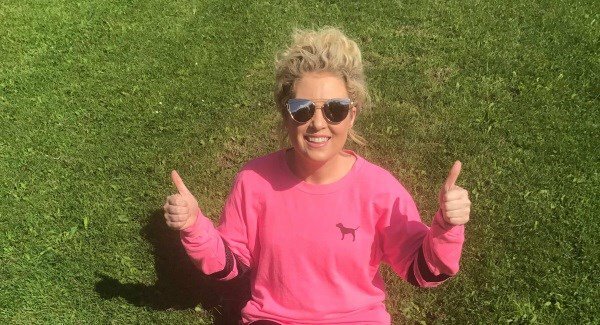 Read this article in the Irish Examiner and be amazed at her positive attitude. We're all proud of her! And if you haven't seen the photos from the Great Pink Run yet, click here for a slideshow called "I'm on my way". On 18 January members of the Manor House Smile Committee attended the annual Cycle Against Suicide Student Leaders' Congress. This year the event was held in the University of Limerick. The day began at 6.45am when 50 sleepy students got on the bus in Raheny, excited at what the day would bring. Three hours later we arrived and immediately could sense the positive energy all around. 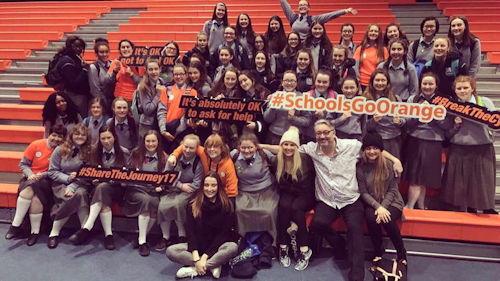 The Congress was put on by the 14 Student Leaders for 'Cycle Against Suicide', one of whom was our very own Emma Ormonde (5th year). Throughout the day the schools (including Manor House) showcased their projects - the work that they had done this year to help break the stigma surrounding mental health. The theme this year was "Share the Journey" so there was a huge emphasis on this. Speakers included the hilarious Bob Carley, the Ironman champion Jerry Duffy and psychologist Eddie Murphy, who all spoke inspiring words. Personal stories were shared, all of which were very moving. Two key messages that emerged were to truly be yourself and to talk to someone about your mental health. Organisations such as "Teenline", "Samaritans" and "Childline" had stalls there to promote support. There was music too from The Strypes, Orla Gartland and more. We danced, we laughed, we felt so many emotions. It was an amazing opportunity and we hope to bring what we learned back to our school. Video by Ms McGarry's 5th year LCVP class. Video by Mr Abrahamian about the 6th years' 'Lovely Letters'. In order to spread positive mental health Manor House Smile Committee present our Cycle Against Suicide Student Leader Congress video. Our message is that it is okay not to feel okay and it is absolutely okay to ask for help. Join us in our mission to break the cycle of suicide on our island of Ireland. Enjoy our video. The song "Little Love" was written and performed by Emma Ormonde, TY. On Wednesday 9 March 2016 Jim Breen visited Manor House. Jim is the founder of "Cycle Against Suicide"; an organisation whose aim is to eradicate suicide on the island of Ireland. To do this, they promote positive mental health and help-seeking behaviour. This organisation was the initial inspiration for the formation of our school's Smile Committee and so it meant a lot that Jim came to our school. First of all, the Smile Committee had the opportunity to meet with Jim. He gave us some ideas and left us thinking of more. We then led Jim down to the gym, passing our newly-transformed mirror room on the way. In the gym we had a whole-school assembly, where Jim explained about his organisation and shared stories. He talked about the "little things", coincidences and luck, as well as taking a leap of faith. Simply being in Jim's presence can make anyone happy; he seems to radiate good vibes with his enthusiasm and way with words. To complement this, there was music from the Emmanuel choir. Emma Ormonde performed her song and Jessie Clohisey as well as Rachel Carroll also spoke. The atmosphere in the gym that morning was magical. Follow the route being taken by the Cycle Against Suicide team in May 2016 - here is the link. The Manor House girls met up with them in Wexford on Friday 6 May. The photos say it all. We had a lovely turn-out for the Fun Walk / Run in St Anne's Park in Raheny on Wednesday 27 April. Passers-by asked us what we were doing. "We are here (in orange) to raise awareness about mental illness and to tell people that it's ok not to feel ok....." we replied. So, we raised awareness. Take a bow, all who attended, ran, sloped, walked, chatted, patted dogs....! 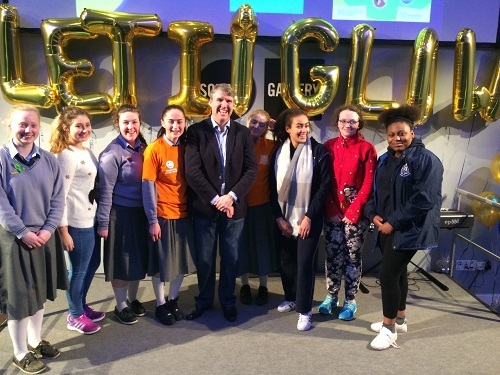 It was great to see fellow students from St Paul's, Raheny and Holy Faith, Killester. Thanks to Mrs Robinson for organising the event. Ms Fagan also did a montage of the day's events. Here it is - enjoy! 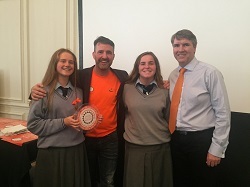 This is a photo of two of our students receiving the Cycle Against Suicide 'Ambassador School' award from Jim Breen (- founder of Cycle Against Suicide -) and Dr Niall Muldoon (- Ombudsman for Children). The award ceremony took place in the Royal Hospital Kilmainham on 23 September 2016. 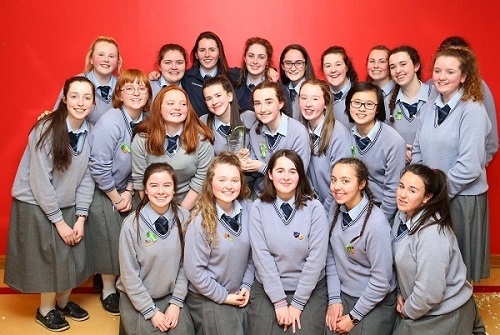 Manor House is one of only 19 schools in Ireland to have received the 'three in a row'. The Ambassador School programme, established in 2013, aims to encourage schools to become actively involved in mental health promotion. The programme provides a framework, structure and incentive for schools to integrate mental health activities into their school planning and rewards schools (like Manor House) that go the extra mile. This year's theme is 'Share the Journey'. We are very proud of the work our students do to spread the message that "it's ok not to feel ok and it's absolutely ok to ask for help". We look forward to the year ahead.